Successful performance at this level indicates that a candidate can consider themselves as an able improving sea paddler rather than a beginner. During assessment the candidate would be able to demonstrate personal competence paddling in wind conditions of no more than Beaufort Force 3 or Sea State 3 as part of a led group. Sea paddlers who use sit-on-top kayaks may be interested in the BCU 3 Star Sea Sit-on-Top Award. 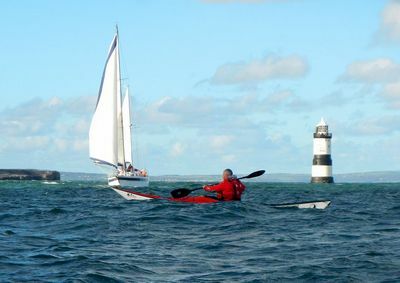 A sea kayak suitable for journeying on the sea and one that allows the candidate to safely and effectively complete the requirements of this syllabus. If in a kayak fitted with a rudder it must be disabled for the duration of the assessment. It is required that boats should be fitted with total buoyancy (e.g. watertight compartments or airbags). Candidates must complete all elements of an assessment in the same type of craft. Personal equipment required by an able improving sea paddler and appropriate to the conditions and the remit of the award.